On a recent morning flight to Palm Springs, I was chatting with the woman seated next to me. She was a former flight attendant who had retired to Palm Springs. It had been over 15 years since I last visited the desert, and she was happily giving me recommendations for restaurants and bars I should check out during my stay. More specifically, she was giving me the insiders’ scoop on the town’s happy hours: where to go, where to sit, what time, and what to order. For example, she told me if you sit at the bar at Lulu Bistro, you can order off the happy hour menu all day, any day of the week from 11:00 a.m. to close. 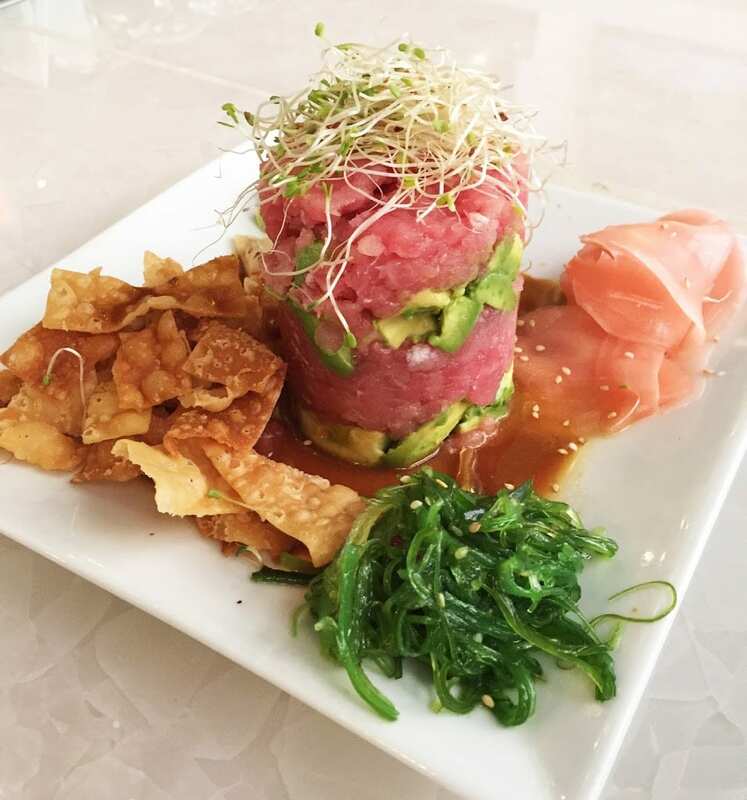 She told me to order the Tower of Avocado and Ahi Tuna Tartar. When the beverage cart wheeled by, she ordered a cranberry juice, produced an airline-size bottle of vodka from her purse, and made herself a morning cocktail. Ten minutes later, another flight attendant walked by and recognized the woman seated next to me. The two of them caught up a bit and then my retired friend asked the flight attendant for a cup of ice to go with her drink. The flight attendant returned with the cup of ice and also slipped my friend another airline-size bottle of alcohol. She twisted the cap off, poured the whole thing into her drink, and took a sip. “This isn’t vodka!” my friend exclaimed, taking a closer look at the empty bottle. It was gin, not vodka. “Oh, well,” she said, shrugging, and gulped it down. When the flight landed that morning, the temperature was already inching toward 100. I drove straight to the airy Lulu Bistro, bellied up to the bar, and ordered an icy mojito and the Tower of Tuna. Served with fresh avocado, bean sprouts, seaweed salad, and pickled ginger with a sesame soy sauce, it was a cool introduction to Palm Springs’ around-the-clock cocktail culture. But as it turned out, I didn’t need to seek out other happy hours. Nearly all of the boutique hotels in Palm Springs have happy hours of their own with complimentary before-dinner drinks served nightly by the pool. El Morocco Inn & Spa and The Westcott Palm Springs both graciously shared recipes for making their signature martinis. They’re perfect poolside concoctions for a hot summer day. 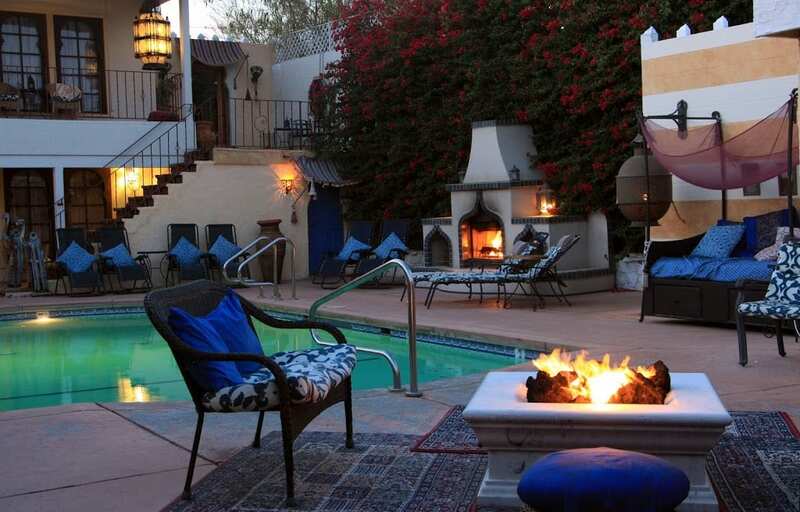 El Morocco Inn & Spa in Desert Hot Springs serves their signature “Morocco-tinis” poolside at this enchanting, Moroccan-inspired oasis. Sheer fabrics billow in the desert breeze while faint strains of Moroccan music drifts overhead. The outdoor bar overlooks a flickering firepit and a warm, natural spring-fed pool surrounded by glowing lanterns, lounge chairs, Moroccan poufs and daybeds piled with pillows. The inn’s nightly happy hour begins with a traditional Moroccan hand-washing ceremony with rosewater and followed by rounds of the inn’s signature drink. The Morocco-tini mixes equal parts orange and cranberry juices with sake and a splash of “lemon seltzer” (a.k.a. Squirt), and is served on the rocks in a sugar-rimmed martini glass with an orange garnish. The complimentary drinks are served nightly between 5 and 6 p.m.
An intimate desert retreat in the historic Movie Colony neighborhood of Palm Springs, The Westcott Palm Springs (formerly POSH Palm Springs) serves up outstanding service, complimentary hors d’oeuvres and its signature “POSH Martini.” Tony Gangloff blends ice, orange juice, a splash of banana liquor and equal parts vodka, tequila and coconut rum for a cool, summery drink that is perfect for sipping poolside. The tranquil courtyard pool at The Westcott Palm Springs is surrounded by lounge chairs, desert plants, and offers views of the San Jacinto Mountains. White arched colonnades on either side of the pool are lined with sheers that billow in the breeze. A hot tub is located at the far end. 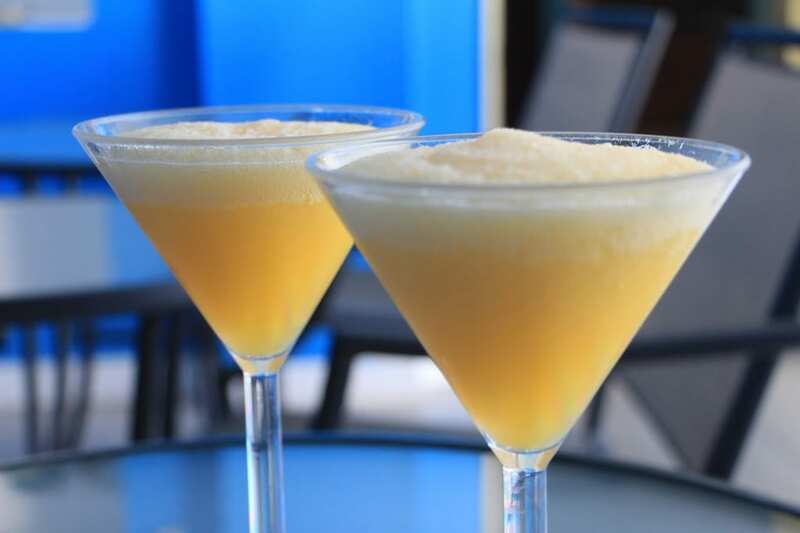 The complimentary happy hour is served each evening from 4 to 5 p.m.